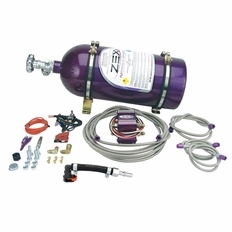 Add this kit to an otherwise stock Jeep Grand Cherokee SRT8 and you�ll be running low 12�s in the quarter mile. Mildly modified Jeep SRT8s have already been in the 11�s. The custom Jeep SRT8 fuel rail adapter clears the tight fuel rail connection at the back of the engine and is adjustable from 75 to 125 hp. Included is special fuel jetting for the 6.1L Hemi engine. This kit installs in 2-3 hours with basic hand tools. The part number for this item is 82241 and it fits 2006-2010 Jeep Grand Cherokee SRT8 6.1 models.